Millennium 7 Publishing Co.: Boost YOUR Other Marketing With Social Media? 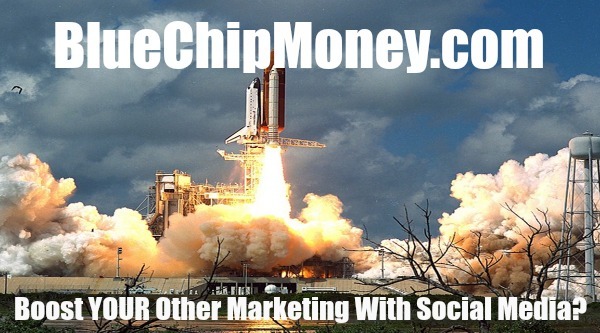 Boost YOUR Other Marketing With Social Media? How to use social media to boost your company's other marketing efforts.. It will elevate all your other efforts and improve your ROI by a hefty margin! While social media is a solid path for expanding and deepening brand awareness, it’s unlikely to be your company’s only marketing strategy. Other avenues—from content marketing to corporate events to traditional tactics—can take up significant portions of your advertising budget. A 2016-17 study from Gartner illustrates that the average company spends 12 percent of its annual revenue on marketing. And while 92 percent of marketers agree that social media is important to their business, that doesn’t mean your social efforts must exist in their own silo, separate from your company’s other campaigns. Instead, elevating every campaign in a way that allows them to work together will help you get the most out of your limited budget. Events are a great way to make a positive impression on potential customers, and marketers across the board have taken notice. According to the U.S. Bureau of Labor Statistics, the event industry is predicted to experience 44 percent growth from 2010 through 2020, which exceeds the growth predictions for most other industries. While it would certainly seem obvious to connect events with social, EventTrack reports that a full 11 percent of brands apparently fail to use social media in conjunction with their in-person events. Utilizing social media to broaden the reach of your event marketing doesn’t have to be complicated. According to the Event Marketing Institute, 74 percent of event attendees leave an event with a more positive opinion of whatever was being promoted, whether it was a company, brand, product or service. Linking this boost with a well-orchestrated social media blitz can extend the positivity to consumers at large, even if they didn’t experience the event firsthand. 64 percent of marketing execs believe word of mouth is the most effective form of marketing. They have good reason to think so, as this form of marketing drives around $6 trillion in annual customer spending, with research suggesting that it accounts for as much as 13 percent of all consumer sales. While marketers can’t force customers to sing their praises on social media, they can make it much easier by providing the tools for them to do so. Sandbox VR is doing just that. The company provides an immersive, all-encompassing virtual reality experience to its users, using its technology and location-based capabilities to drop its participants into zombie rumbles and pirate standoffs. Players are given a shareable video showing a side-by-side comparison of their personal Matrix-like VR experience and what an outside observer would see looking at the green screen. Sandbox VR’s proprietary “Demand Generation Engine” builds real-time mixed-reality videos made specifically for social sharing to nurture the word-of-mouth marketing that generates prospective customers. Social media is a vital component of any well-executed on-site strategy. To generate inbound marketing opportunities, 53 percent of marketers tout blog content as a top priority, and blogs have been rated the fifth-most-trusted source of accurate online information. Social sharing of your blog content will increase engagement on your company website, in addition to building trust in your social platform as a valuable resource. 94 percent of people who share posts do so because they find them helpful and think others might, too. When you can promote social sharing of your blog posts, the result is increased engagement with not just individual posts, but your entire social media campaign. Media buying has expanded far beyond TV and radio ads. In an average week’s primetime TV hours, YouTube reaches more people 18 and older on mobile devices than any of the cable networks do on television. In fact, while watching TV, two-thirds of YouTube viewers are watching the platform on another screen—and it’s probably during the TV ads. A well-placed hashtag or effort to encourage social sharing goes a long way, and since TV ads often enjoy an extended life on YouTube, those efforts can be extended by including your video ads in social posts. In general, social video generates an astounding 1,200 percent more shares than text and images combined. Complementing your media buys with your social campaign will result in much higher viewership of those ads and much higher engagement on your social accounts. Related Article: YOUR Social Media Virtual Storefront? Social media receives incredible amounts of attention, and the biggest companies in the world have entire teams devoted to winning customers over with their social media accounts. Still, it isn’t a complete marketing solution. Use your position as a social marketer to interact with your customers and encourage them to help you build hype by providing fun, easily shareable content for them to broadcast to their networks. If you use social media in the right ways, it will elevate all your other marketing efforts and improve your return on investment by a hefty margin. Guest Authored By Chirag Kulkarni. Chirag is Founder of Taco Agency, chief marketing officer of digital pharmacy Medly, and he has helped companies like Expedia with digital marketing. Follow Chirag on Twitter. "If you use social media in the right ways, it will elevate all your other marketing efforts and improve your return on investment by a hefty margin.."